Here is what The Light Collective team is doing for tonight’s Full Moon. Rituals to connect you with the Earth sign Virgo. Tonight we will be aligning ourselves with the Super Full Moon in Virgo. This is the strongest Super Moon of the year, with the Moon being at its closest proximity to the Earth until 2020. Energetically and emotionally, this may mean we feel the already intense vibrational effects of the Moon even more strongly. As the moon waxes to fullness there is a sense that it energetically illuminates those parts of our lives that until now have been kept hidden or unseen. These may start to rise to the surface, in need of attention. That is why this month it is important that you give yourself some time and space in practice and meditation, to uncover and listen to those hidden needs. This is necessary to create full alignment within both your physical self (body), as well as your spiritual self (soul). Virgo is a practical sign, aligned with the Earth and the body, Pisces (the current Solar alignment) on the other hand is dreamy and spiritual. Finding balance between our daily life on the worldly plane and our internal spiritual and dream world will be supported at this time. Also the potency of this moon is increased due to it’s alignment at 0 degrees in Virgo. This rare occurrence brings with it the power of Zero- a blank canvas for all of creation, representing our own limitless capacity to create opportunities. So now is the time to manifest with a fresh perspective and power! If you aren't joining us for our Full Moon Yoga & Sound Journey practice tonight, we encourage you to practice a sacred ritual to align with this rare energy. It is the perfect time to ground down, create stillness, as well as to release negative energy, anger and grief in aid of personal healing and development. With the Moon in practical grounded Virgo and Sun in visionary dreamy Pisces take this opportunity to turn your wildest dreams into reality. This month marks another 29 days since our last Full Moon, and tonight we celebrate the Full Moon in Virgo and the Sun in Pisces. As these two powerful cosmic bodies sit on opposite sides of the astrological chart we can choose to feel the impact of these challenging aspects, or learn to harness the energy for our own growth and development. The Virgo Moon brings with it grounding and organisation. It is highly practical, and invites you to stop and take stock, even celebrate the year that has already passed. The heat of Summer and the excitement of a new year can propel us ahead with urgency and flurry- so our Virgo Moon energy is a welcome moment to take some time out. A breath to recalibrate and focus on what it is we are here to create and manifest. A chance to give clarity not only to our desires, but also to our dharmic path and soul work. Light a candle, burn some earth smokey incense and used some grounding aromatherapy oils like Clary Sage. Do a few rounds of Nadi Shodana. Meditate on the breath, use the exhale to connect to the earth and the inhale to connect to the energy of the sun and the moon above. - celebrating what you have achieved in the last year, physically and spiritually. Seal your practice by imagining white light surrounding you and all of your dreams and ideas, protecting them, then blow out the candle. Stand in Tadasana. 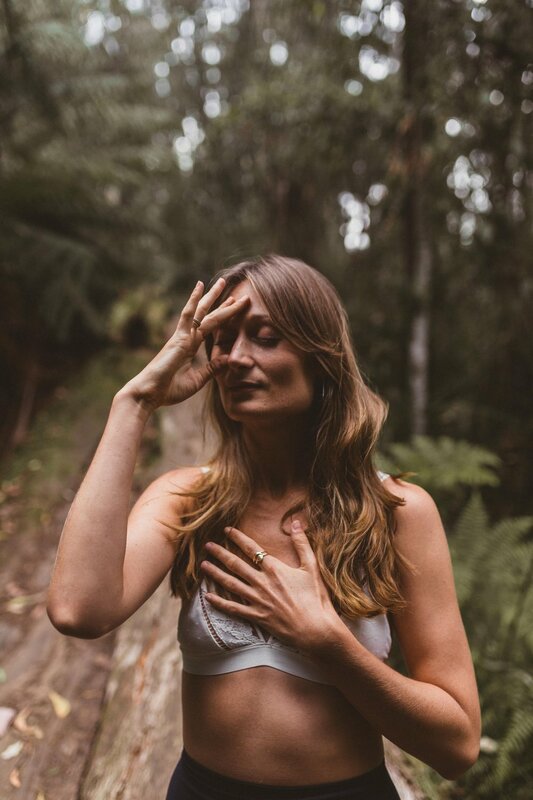 Root down into the earth through your feet.
. Take 3 rounds of breath – mindfully rising your inhale from the deepest part of your core, and exhaling long and slow out your mouth. Make sure you feel strong in your stance, and supported by the Earth before beginning this warrior sequence below. Repeat minimum 3 rounds of this warrior sequence (1 round is complete when you balance left + right side). If these Mantra’s do not resonate with you, then change them to suit what you wish to embody at this time. If doing so, make sure to keep your Mantra in the present tense, e.g - I feel, I am.. Affirmations will only work if the words vibrate in your own body – if these certain words do not, then switch them up to suit you.